The mighty hosta is no super hero, but its nemesis Hosta virus X sure is. 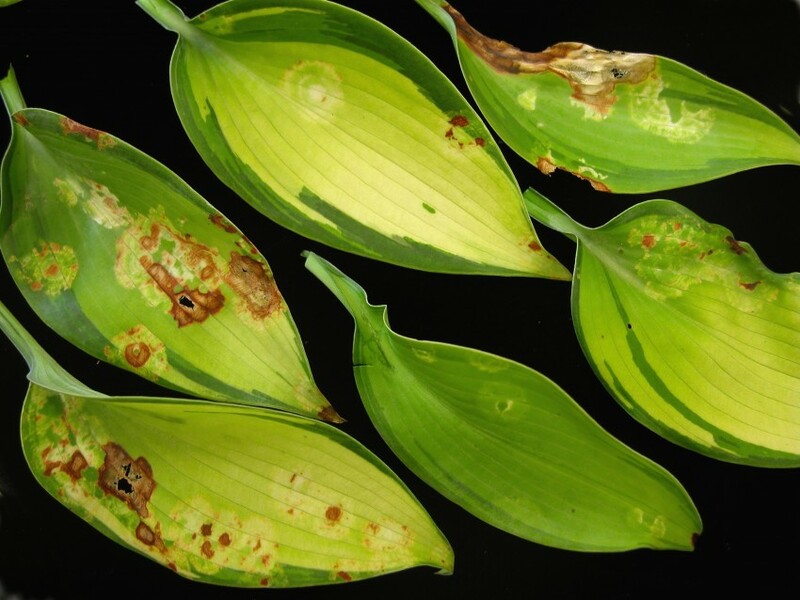 Hosta virus X (HVX) is a rather new disease of hosta that has become a regular visitor to the Plant Diagnostic Laboratory. We get samples of hosta with the disease once or twice every summer, usually from a nursery, and we just got this year’s supply. Virus symptoms are quite variable in any plant. 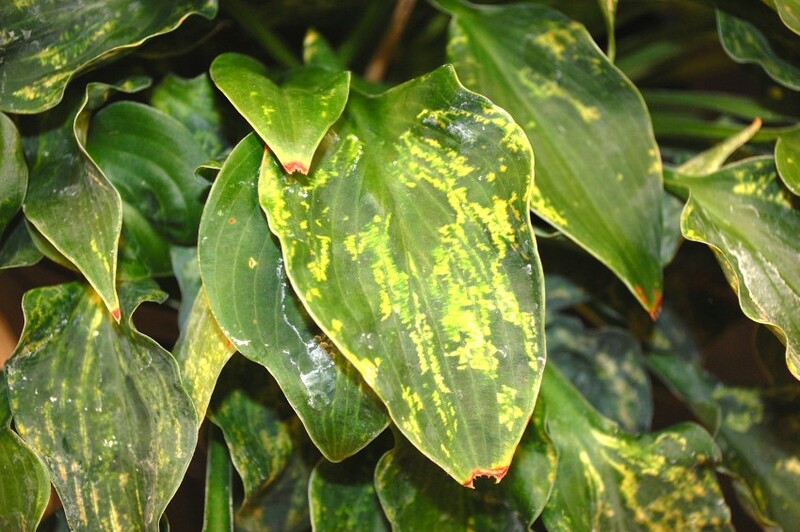 The symptoms of HVX in hosta can include some or all of the following: line patterns, mosaics, chlorotic blotches, puckering and twisting, or ringspots. 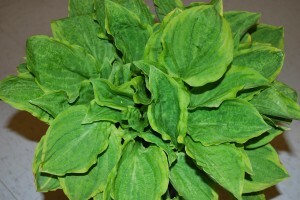 HVX can take leaves and reduce the overall vigor of infected plants. Careful with symptoms, because similar symptoms can be caused by other viruses. 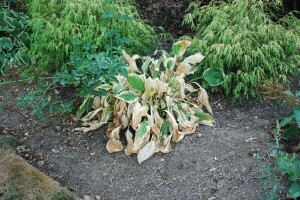 Furthermore, there are hosta varieties that can become infected, but display no symptoms at all. Another major complication for recognizing HVX symptoms is that some perfectly normal hosta varieties – and there are thousands of varieties – are variegated or have line patterns, blotches, and oddly shaped leaves that look scarily like diseased plants. In fact, before the disease was characterized in 1996, there were several named varieties on the market that were indeed HVX infected! The primary route of infection for HVX is through propagation from infected plants in nursery production. We generally count on our nursery producers to recognize the disease and practice clean culture, which of course, is why most of our samples do indeed come from concerned nursery folks. Once the disease reaches the field, however, transmission is mechanical. Mechanical transmission can occur through HVX-contaminated cutting tools when dividing plants, when removing senescent leaves and scapes, or by routine handling of infected and healthy plants. There are no controls for HVX. Infected plants should simply be destroyed. When culling diseased specimens, be sure to get all the plant material, because residual plant tissues (and composted plants for that matter) can cause infection in susceptible replacement plants. 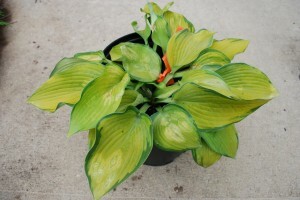 Be aware that not all odd looking hostas are infected with HVX. 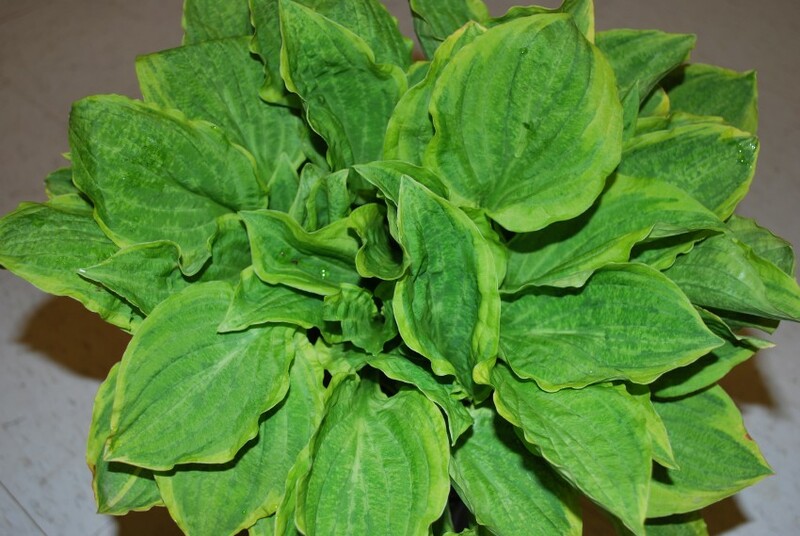 Hostas are occasionally found to be infected with several other viruses including: Impatiens necrotic spot virus (INSV), Tomato spotted wilt virus (TSWV), Arabis mosaic virus (ArMV), Tobacco ringspot virus (TRSV), Tomato ringspot virus (ToRSV), and Tobacco rattle virus (TRV). We see our fair share of INSV infected plants in the laboratory too. Of course, ISNV is a whole different ball of wax and fodder for another post! My friend Dr. Frank Rossi at Cornell hates hosta like I hate boxwood. I’ve heard him say on more than one occasion on our weekly turfgrass conference calls that he hopes the deer eat the hosta his wife plants around his farm. (I once read an article that implicated deer transmission of HVX.) I’ve got a suggestion for Frank – I’ll send you an HVX infected plant and then you can leave the gate to the alpacas unlocked… maybe not… the alpacas probably hate them too!